This feature highlights new and innovative tools that have the potential to reduce the risk inherent in first responder duties, expand the reach of small departments, and save lives. Hemorrhage, the profuse bleeding that can occur when a blood vessel or vessels have been ruptured, is a common concern in victims of substantial physical trauma. It may occur internally or externally, and has the potential to rapidly result in permanent damage, or loss of life. To cease or reduce hemorrhaging in severe emergency situations, the tourniquet has been a lifesaving stopgap measure to prolong patient life en route to a medical facility. A tourniquet works by applying pressure to the vessels between a wound and the heart, effectively “tying off” the blood flow to the point of injury. This technique has a long history in emergency and especially battlefield medicine; however, standard tourniquets are limited in their application to trauma that has occurred in the extremities. The Abdominal Aortic Tourniquet (AAT) is a compression device used to stop “junctional hemorrhages,” severe bleeding occurring at the junction between the torso and the extremities. Initially developed for military applications, the AAT is now being implemented domestically and has been approved for use by the FDA. When in operation, the device is wrapped around the patient’s upper or lower torso and tightened using a windlass for stability. It is then inflated using a wedge-shaped bladder that indicates when a sufficient pressure has been reached by displaying a green strip. While originally designed to stop blood loss in the pelvis and upper legs by providing compression at the aortic bifurcation, it has also successfully been used around the upper body to stem a severe hemorrhage caused by a bullet wound. The AAT can be applied in under a minute and has been tested as safe for use for up to an hour when applied to a lower junctional hemorrhage. Full case studies, specifications and research on the AAT’s application in civilian and military usage may be downloaded here. The AAT is focused at a significant capability gap identified by the Institute of Surgical Research for care on the battlefield: how to address uncompressible hemorrhage that is not treatable by a tourniquet in the leg, groin and inguinal region. This significant capability gap focuses on treatment for a class of preventable deaths not previously treatable. The solution to this problem must be stable, easy to apply and completely stop the loss of blood. The AAT™ is capable of this, and animal and human studies have demonstrated its safety and efficacy. The AAT™ provides a rapid application of pneumatic compression to the aorta at the abdominal-pelvic junction to occlude blood flow in the inguinal arteries. The specific claim of the device is to occlude arterial flow through the inguinal region. The target of the compression is the aortic bifurcation, which has historically been identified in relation to the umbilicus or the superior margin of the iliac crests. Difficult bleeds in the inguinal region continue to be a significant source of morbidity and mortality on the battlefield. Providing solutions for treating these wounds have direct life saving results. Wounds to the pelvis and inguinal region are now preventable causes of death. 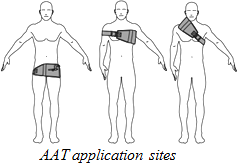 The AAT™ is a circumferential device that utilizes a windlass. This greatly increases the stability of the compression. The pneumatic wedge shaped bladder provides focused pressure to squeeze the blood vessels passing through the lower abdomen and preventing flow. The research referenced below demonstrates the safety of up to one hour of application and its effectiveness in non-invasively cross-clamping the aorta or fully stopping all blood flow to the pelvis and lower extremities. In essence the AAT™ acts as a valve to figuratively ‘turn the faucet off’ and prevent the further flow of blood out of wounds below its application site. Blood is the vital component to surviving blunt or penetrating trauma in the golden hour. It allows oxygen to be carried to the heart, brain and kidneys. Every drop of blood lost impacts survival. Why let any of it spill to the ground when we can prevent its loss? Georgia Health Sciences University (formerly the Medical College of Georgia) has conducted research on the device using a swine model in 2009. Flow was undetectable in the femoral catheter during the tourniquet application. For hemodynamic variables, there were no significant differences in MAP or CVP measurements among animals. However, using one way repeated measures analysis of variance, there was a significant difference in MAP (P = 0.008) between 0 and 55 minutes for each subject. Serum potassium did not reach clinically significant numbers. However, serum lactate was significantly different between times 55 minutes (3.6 mmol/L +/- .95) and after tourniquet release 65 minutes 5.9 mmol/L +/- .87) (p <0.001). Gross and histological examination revealed no signs of significant ischemia or necrosis of the small and large intestine. These data were presented at the Advanced Technology Applications for Combat Casualty Care conference in August 2009 and the American College of Emergency Physicians Scientific Assembly in 2009. Application of the device was studied on humans in 2011 again at the Georgia Health Sciences University and found to be safe and effective during the protocol. The Common Femoral Artery (CFA) was reduced to a no flow state by applying an average of 191 mm Hg. The device was associated with moderate discomfort that resolved completely with device removal. These data were presented at the Advanced Technology Applications for Combat Casualty Care conference in August 2011. Compression Works received FDA approval for the AAT™ on October 22, 2011. The AAT™ is made in the USA. 510(k) approval available upon request. Dr. John Kragh with the Institute for Surgical Research is currently pursuing additional research to add to the understanding of the device, its use and removal. The Naval Medical Research and Development Unit’s Expeditionary Medicine Division, in conjunction with the United Kingdom’s Ministry of Defense is also beginning research on the AAT utilizing pressure arrays and human subjects to add to the database on this device. Georgia Health Science University is conducting research on a pelvic junctional injury animal model comparing the AAT to current hemostatic dressings. Additional research in the use of the device in EMS for blunt trauma and cardiac arrest is also beginning in 2012. The AAT is currently available in the US from Speer Operational Technologies (www.speeroptech.com) , in the EU from Fenton Pharmaceuticals.